Two conservative candidates in Iran’s presidential election have made a last push for votes in a televised debate. The incumbent president Mahmoud Ahmadinejad and his opponent Mohsen Rezai exchanged views on domestic and international policies. Mohsen Rezaei is a former commander of the powerful Revolutionary Guard. Two other candidates vying for the top job are former parliament speaker Mahdi Karroubi and Mir-Hossein Mousavi, formerly the last Prime Minister of Iran. Stephen Zunes, an eminent scholar on international relations, who has met President Ahmadinejad, believes he has a chance to be re-elected. “I wasn’t very impressed with Ahmadinejad himself. But the fact is that on many of the key issues, even though he is not all that popular with the Iranians, that some of the basic positions on the nuclear questions indeed has widespread support. And basically this double standard the United States has, that allies, like Israel and Pakistan and India can have these full-blown nuclear arsenals, but Iran can’t even have the potential to build nuclear weapons, is hypocritical at face value. And so, Iranians know this, and Iranians see this kind of double standard. So it’s not about fear of proliferation per se, it’s a fear of challenging the US-Israeli nuclear monopoly in the area,” says Zunes. Meanwhile, the nation is showing huge interest for the upcoming election, says the Iranian Interior Ministry. 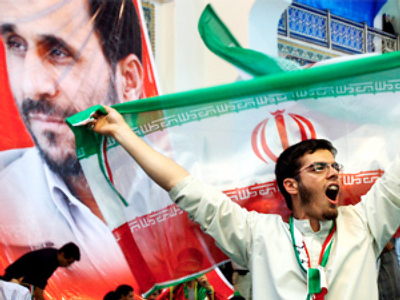 “The turn-over for the election on June 12 will for certain hit a record high,” said on Monday the head of Iran's electoral board, Kamran Daneshjoo.